Station Hollywood: Posto was the biggest hit film of 2017. Shiboprasad Mukherjee and Anindya Chatterjee promoted film Posto in Zee Bangla Apur Sangsar. 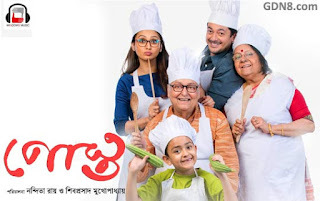 Director Shiboprasad Mukherjee and singer Anindya Chatterjee promoted Bengali film Posto in Zee Bangla Apur Sangsar. The film had been released on 12th May, 2017. Saswata Chatterjee took interview of Anindya Chatterjee and Shiboprasad Mukherjee. Anindya Chatterjee said that during college days they used to write songs, compose tunes and sing them. Then the idea came that they could create a band and record the songs. Upal and others came up and the band Chandrabindo came up. They already had created 9 basic albums till now. They are working on the 10th album which is a kind of achievement on their part. The songs became popular and they all got live shows in different parts of the country. Shiboprasad Mukherjee appreciated the film made by Anindya Chatterjee called Open T Bioscope. When Saswata Chatterjee asked Shiboprasad Mukherjee about his journey as director, he said he initially wrote scripts for Television serials. From there came to develop skills and started writing script for entire films. He faced problems in finding producers for his films in the initial days. His film Ichhe for the first 2 to 3 days did not get audience. But from words of mouth once people came to know that the film had content, the later shows became houseful. His recent films Ramdhanu, Belasheshe, Pratton, all had ended up being blockbusters. He told that Posto was the story of a small boy. The boy was nurtured by grandfather Soumitra Chatterjee and grandmother Lily Chakraborty. His father Jishu Sengupta and mother Mimi Chakravarty did not have time as they had working commitments. All of a sudden Jishu Sengupta decided to have the child with him and take care within his custody. The decision took a rough shape and ended up as a court battle. It was up to the Court to decided who should have custody of child Posto, whether the grandmothers or the parents. So that was the substance of the film. 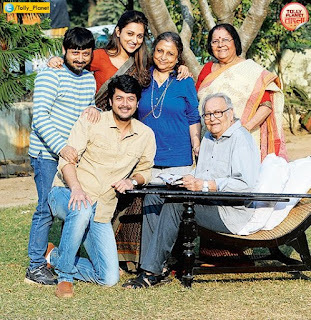 All the artists, Soumitra Chatterjee, Jishu Sengupta, Lily Chakravarty did well and the small child Posto did a fabulous job. Presently Shiboprasad Mukherjee and Nanditaji had created a great reputation in film making. So again it is expected that audience will flock in big numbers to see the film. Saswata Chatterjee wished best of luck for the film.